This is a super easy recipe that turns yer average wally-nut into a wonderfully tasty little munchable. And you can do so much with them. I've used candied walnuts as filler on many a party tray. I've added them to Christmas gift baskets, wrapped in cellophane and tied with a ribbon. I put them out on tables in small bowls surrounded with holiday chocolate kisses and other brightly colored candies. You could use them as topping on a cake, or atop brownies or muffins or pancakes. I have a chocolate bar recipe that I'm planning to make for this weekend that calls for a layer of nuts. Guess what I'll be using! Warning: They are highly addictive. Betcha can't eat just one!! Put sugar, vanilla, cinnamon, salt and milk in a sauce pan and bring to a boil. Reduce heat slightly and continue to stir at a low boil for 1 minute. Place walnuts in a large bowl. Slowly pour sugar mixture over the nuts. 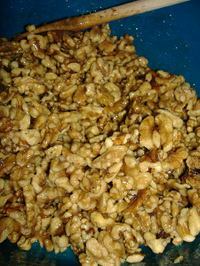 Stir until the walnuts are completely covered and mixture begins to "sugar". Place on a sheet of wax paper and allow to dry and harden fully. If stored in an air-tight container, the walnuts should last a good long while. 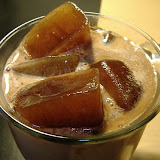 This is a good coffe site, I am like it. The recipe carnival is up and this recipe is in it. Thanks for entering! 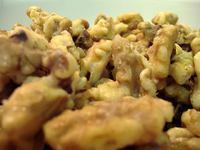 As I sit here eating cashews and drinking tea, I am dreaming of candied walnuts. How wonderful do those sound! Yum!